I had the great pleasure of joining a Westminster Higher Education Forum event today as a speaker. My session was chaired by the Labour MP Mr Alex Sobel and the main theme of the session is around the opportunities and challenges in adopting new technologies in colleges and universities in the UK. The venue was packed with 100+ delegates from over 60 institutions and businesses across England. I spoke about our research findings on the use of VR in education and shared my views on how technologies can empower human educators in Education 4.0. The following are my notes. The official transcripts from all speakers will be available on Westminster website. Virtual reality in its early days was mainly used for industrial simulation and military training in a controlled environment using specialised equipment. As technologies become more accessible, we started to see more use of VR in gaming and education. In education, VR is mostly used as a stimulus to enhance students engagement and learning experience. It helps visual learners, breaks barriers, and can visualise things that are hard to imagine. So we are mostly encapsulating on the indirect benefit. My research group is interested in whether such stimuli can truly improve learning outcome and how, so we know how to improve the technology or use it more appropriately. We conducted an experiment with two groups of university students to compare how well they learn hard sciences using VR materials and Powerpoint slides. Their performance was measured using a short exam paired with interviews. The results suggest that the majority of students prefer learning in VR but there is no significant difference between the two on average scores. A recent research by Cornell University shows a similar finding. However, When we look at the breakdown of scores on individual questions we discovered that students who studied via VR can do very well with questions related to visual information recognition but they struggled to recall numerical and textual details such as the year and location of an event. We think its due to how information is presented and the extra cognitive load in VR. So VR made something better but others worse, it’s a double-edged sword. This does not mean what VR is a waste of money. We need more work to learn how to better use the tool. This means two things: One, we need VR to be more accessible. Not only its cost but more importantly easy-to-use design tools and open libraries that help average lectures to embrace the technology. We also need appropriate metrics and measurement tools to access the actual impact of new technologies, and share that experience with the community. Furthermore, we need to keep eyes on what roles VR should take in education. One thing we can learn from the past is Powerpoint in education. (Powerpoint was invented in 1980s, acquired by Microsoft, and went on to become one of the most commonly used tools in business and education. Powerpoint has drastically changed how teaching is done in classrooms. ) Powerpoint was meant to augment a human presenter but it has become a main delivery vehicle in classroom while lecturers are the operators or narrators of slides. People conclude that Powerpoint has not empowered academia. (Some institutes have banned teachers using Powerpoint. According to NYTimes, similar decisions were also made in the US Armed Forces because they regard it as a poor tool for decision-making.) Many institutes including University of Northampton are moving away from pure slideshow to active and blended learning and use data sciences and smart campus to support hands-on, experimental and interactive learning. So we can certainly learn from the past when we approach VR and other new technologies. Another important aspect is the human factor. At the end of the day, only human educators are accountable to the teaching process. We listen to what learners say, observe their emotions, sympathise with their personal issues and I reason with them for every decision I made while trying to be as fair as possible. My team is work on many computer science research topics related to human factors such as interpretable machine learning, understanding human intent. However new technologies such as VR and AI should be designed and integrated to empower human educators rather than replacing us. While Part 1 “rants” about how function-based machine learning overwhelms data research, this part aims at future opportunities. Many of my childhood friends and I counted ourselves lucky to own a copy of the A Hundred Thousand Whys (Chinese: 十万个为什么), a children’s science book series. It was the only child-friendly encyclopedia you could find in the 70s/80s in China. The book series originated from a book with the same name authored by a Ukrainian writer Mikhail ll’in (Russian: М. Ильи́н). The fact that our parents invested half a month salary on these books in those difficult years showed how much they struggled to answer our never-ending questions of whys. Reasoning is a very important part of the learning process. We humans and other animals learn very quickly from direct experiences for survival. At the same time, abstract knowledge is the core of our human intelligence. We discover rules and develop theories from our observations and experiments so to generalise our findings and use them for situations other than our initial observations. It is believed that “the power of generalization is a property that comes with neural networks” and “abstraction is often attributed to humans and the development of the language”. A conventional function-based machine learning models tend to give us a very good answer under normal circumstances but there will be no reasoning on how the conclusions or predictions were made. It is therefore often referred to as a black box. We don’t know what’s in the black box. Even if we do by illustrating the ML neural networks, chances are we won’t be able to explain it rationally. What made things more challenging (I am ranting again…) is the opacity of the input data to the black box. Data science researchers need to be very careful when handling and documenting the training data because they determine the sensitivity and operational range of your model. However, that’s just me training my own model for research. Do we know exactly what data Google uses to show stuff to us? So we have no clue how the machine works nor how the machine gets its knowledge from. Some may argue that they don’t really care about how things were done as long as we have a good result. This kind of attitude has helped the function-based ML to thrive in the past few years. We are now getting used to the convenience enabled by ML-based software and services without bothering about the whys. So is reasoning still relevant? Even if we don’t expect a machine to ever be as smart as humans, we still need results interpretable to ensure fairness, transparency, and accountability. The fairness concerns with whether resources are shared “equally” between parties or whether a rule is applied consistently. Many researchers including myself argue that fairness is subjective and therefore needs to be measured at the user level. We spent a lot of time looking into human factors (sensual, perceptual, societal, etc.) and studying how the machine can take into account individual preferences and experience. However, I often feel what we do is an exercise of incorporating biases. The algorithm would allocate more resources to picky users and hungry user devices so that there is minimum QoE (quality of user experience) discrepancy across a group of users. You might disagree with my understanding of fairness but at least we are able to discuss what’s right and wrong based on my reasoning. With a high degree of complexity, an ML model can produce excellent outcomes with the wrong reason. The image below from Dr Kasia Kulma’s talk is a perfect showcase. The model which achieves high precision in classifying wolf and husky apparently recognise wolves by detecting snow in the picture. It certainly capitalised on the high probability of snow and wolf co-appearance in an image: a smart move to deliver results but not necessarily what we consider as intelligent. For fairness, the reasoning often outweighs the outcome. The transparency is a measure for the general interpretability or opacity. There are different opinions on the measurement target. Some believe it’s about the model itself (i.e., the interpretability of how the model works). However, this might be too much to expect for intricate deep learning models. Furthermore, forcing higher transparency affects how models are built and potentially limit the use of some useful features. There is generally a trade-off between transparency and model performance. As a compromise, the interpretability can be set on the results coming out of a model rather than the model itself. This means that we attempt to interpret how the input features impact the results (on a much smaller scale). It would also enable some hypothetical reasoning to support humans to optimise a solution. When it comes to using ML in critical missions such as performance review, credit rating, and autonomous vehicles, the main concern is people can get hurt when things go wrong. And that may be due to the wrong usage of training data or the algorithm itself. Ultimately, humans are accountable for what machines do. Even if its something that the machines taught themselves to do, its human who instructed the learning process. Prof Ben Shneiderman‘s talk covers this topic quite extensively from an HCI perspective. However, not many people consider the human-computer relationship as part of ML/AI research. Zero-control automation has a pivotal role in future network and system designs: it’s impractical to get human to make every single decision and we want to reduce human errors when humans are involved in decision making. Therefore, algorithm accountability is a technical challenge but perhaps more of a regulatory challenge. 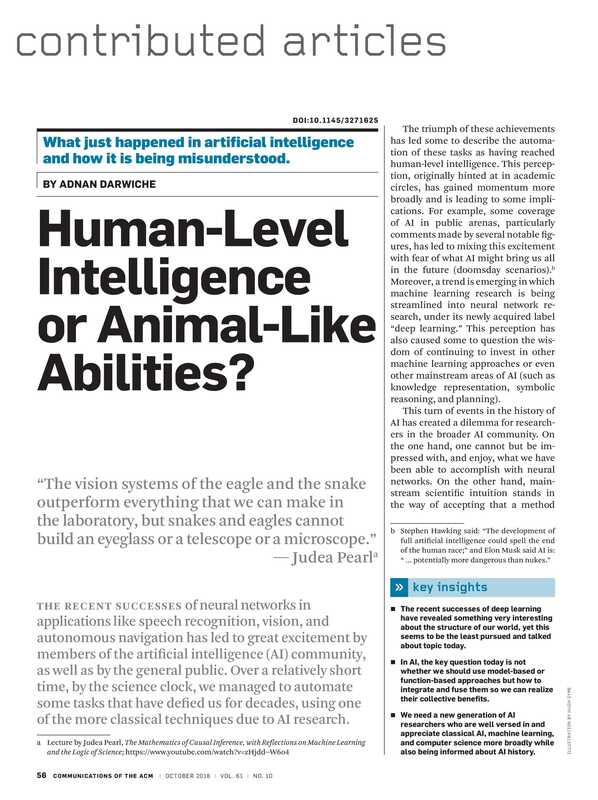 In a recent issue (10/2018 Vol.61 No.10) of Communications of the ACM there is a very interesting article by Adnan Darwiche titled “Human-Level Intelligence or Animal-Like Abilities?“. Adnan took a balanced view of the current development in AI and its related field, and in many respect challenged many of the AI hypes. A lot of the discussions, especially the ones that compare function-based and model-based approaches echo my experience with data-driven research in the past ten years. One of the main research challenges I faced many years ago was modelling the perceptual quality of video content so any quality assessment (e.g., Netflix wants to know what level of QoS it has at the user side) can be done by a “golden-eye objective model” without human intervention. The workflow is simple: build lots of test videos “corrupted” by network impairments -> do subjective experiment to collect user opinions on the videos -> build an objective model by correlating user opinions and impairments -> optimise the model. Function-based machine learning such as Neural Networks was an option for data modelling but they were not considered as a good choice back then. Why? people didn’t feel comfortable champion something that is very difficult to reason. While function-based learning is aggressively powerful in achieving good performance, you end up with tens of parameters going in different directions and there is usually no logical connection between the parameters and the theory that underpins your research. Therefore, you don’t really need a ton of area knowledge to get a decent model as long as there are sufficient data available. So, using this type of learning felt like cheating and was not considered as “proper research”. What makes things worse is that you won’t be able to generalise your findings beyond the scope of the experimental dataset. I ended up following the “convention”: build a theoretical framework (based on psychology, anatomy and physiology of the human visual system, and video compression standard), then use logistic regression (and some other model-based learning tools) to complete a model. The model performance is more than acceptable and the design is backed by discussions of the logic, necessity and data range of every parameter. Soon after that, the world of AI drastically changed. With the increasing availability of data, computing resources and very smart tweaks such as stochastic gradient descent in fitting functions, AI researchers have proved that if the tasks are sufficiently specific (or localised), we can use (networks of) complex functions to fit the data and complete low-level cognitive tasks with little necessity of modelling the human’s reasoning process. The seemingly primitive learning approach (that we looked down on) is winning by brutal force. At the end of the day, it’s the result that matters, especially in the eyes of the general public. If the training dataset is large and broad enough, it is very likely that a prediction can be made with the support of ground truth closeby. On top of that, applications, especially interactive ones, can be programmed to continuously learn and improve from user inputs. So the more we use them, the more data they get from us and the better they’ll get. We just need to accept that the logic employed by these applications to conduct a task may not be the same logic used by humans. This is particularly obvious when human perception and emotion is involved. My 5 years old boy wants a red bike because he thinks the red ones go faster. His decision might have been influenced by the data he used for model training: Lightning McQueen is red and fast, Blaze the monster truck is red and fast, Ferraris are red and fast, etc. A function-based model would make the same “mistake” and some more data on fast blue vehicles or slow red vehicles will “fix” it. But it won’t fix for my boy. He is well aware that the colour is not 100% correlated with the speed (all sorts of new-gens are faster than Lightning in Disney Cars 3). For him (from the human’s perspective) red is a positive expression/statement associated with a vehicle. In this particular context, the absolute speed/acceleration doesn’t matter, it’s the sensation that counts. The ability to reason abstractly (also known as fluid intelligence) is often what separates high-level intelligence from a static knowledge base. This leads to the question: Is it appropriate to call function-based learning Artificial Intelligence while there is little intelligence in it? As is pointed out in the article, “The vision systems of the eagle and the snake outperform everything that we can make in the laboratory, but snakes and eagles cannot build an eyeglass or a telescope or a microscope”. Just because a machine can deliver the same or better results in a task compared to human, shall we call it intelligence? Compared with other types of AI, function-based learning is principally less intelligent but it is certainly dominating the discussions in the AI-related work due to its reasonable performance in classification tasks (which underpin many useful applications). Does the level of intelligence really matter when the job is done right? Or should the definition of intelligence be dictated by how animals learn? One way for AI and human to coexist is intelligence amplification (IA) where each side complements the other in decision making. However, the idea is based on the hypothesis that machines are smart enough to do things very well but at the same time stupid enough to not understand what they are doing. If the machines are capable of both model and function based learning. Why would they still need us? Recently Yoana Slavova and myself were interviewed by a research and consultancy company 3Rs IMMERSIVE on the use of VR in education. We shared our experiences from previous experiments and an outlook for future research. 1) What were you trying to achieve through your research? Over the years we have worked with numerous primary and secondary schools on VR trials that aimed at improving student engagement. The novelty factor of VR can undoubtedly contribute to better student attention in classrooms. As educators in University, we wanted to know whether VR-assisted learning can reach beyond the initial “WOW effect” and improve knowledge acquisition in comparison with the conventional learning using lecture notes. 2) Your paper showed that ‘ students are less likely to recall or recognise specific details due to the additional cognitive load in VR’ – why do you think this is, can you elaborate a little bit on this? We think the cognitive load can be attributed to the use of new technology and also how media content is developed. Several students who claimed in our research interview that they “learned a lot” from VR content struggled to recall details such as the year and location of key historical events in comparison with students who studied using just lecture notes. This indicates that students might have been overwhelmed by the VR environment and the dynamics of the content. Cognitive load is not necessarily a negative factor in education. The more attention we paid to something, the more likely it is to be remembered. The challenge is to allow learners to focus on the details that are essential to learning. 3) Did you put in place any measures to lower cognitive load beforehand? ie allowing students time to become familiar with the device or making adjustments to the design of the content within VR? Participants were given general guidance of controls and how to navigate through the content. We expected university students to pick up the technologies quickly. We plan to carry out more studies on how to better measure the cognitive load in VR and its impact on learning. 4) Do you have any advice for VR designers as a result of your research? There are useful design principles we can borrow from computer games design to build better VR content for education. We really need to think about different aspects including storyline, cameras, level setup, visual overlay, user controls, and multiplayer while trying to avoid overwhelming your audiences within their learning tasks. VR in education also deserves a new set of designs rules. For instance, our research shows that text content still has its unique role in learning so we can work on how to augment rich VR content with simple and legible texts as a pathway to improve learning outcome. 5) What sort of content is VR best used to teach in your opinion? The teaching of subjects like medical sciences, geography and arts can certainly benefit from the use of VR. However, I wouldn’t be surprised to see creative use of VR in any subject areas once VR developing tools and resources become more accessible to educators. 6) Are you doing any further work in this field? Yes. We have a few VR-related projects in our team. We have been working with a secondary school on coaching sixth form students (between 16 and 18 years of age) to develop VR courseware for their younger counterparts. Understanding user’s attention is also a key area in VR research. One of our postgraduate students is experimenting with VR eye-tracking solutions in an attempt to develop content that can react to viewers attention and emotion. In education, this could mean tailored experience for each student’s needs and capabilities. While most University staff members are setteling in our new and modern Waterside campus, we have also welcomed a new workshop space at the Portfolio Innovation Centre on University’s Avenue Campus. The workshop has just had the furnitures moved in but it will soon see lots of research, development, testing, and experimentation. The workshop will support SDCN project as well as any of my reseach students who require short-term R&D space (for final-year projects, MSc projects ,etc.). So I’ll be an interesting place of oscilloscopes, VR goggles, Raspberry PIs, drones, network switches, media streamers and most importantly talented young people. I’ll encourage them to post stories of their research here.